Processing parameters: Parameters 1 and 2, Adobe RGB, and three sets of custom processing parameters (4 parameters with 5 available settings each) can be set . Shutter speeds: 1/4000 second to 30 seconds (1/3-stop increments), bulb, X-sync at 1/200 sec. Highlight alert: In the single image and single image (Info) modes, any overexposed highlight areas with no image infomation will blink. Protection: Single images can be protected or cancelled. Erase: Single image or all images in the CF card can be erased (except protected images). Recharging time: approx. 90 min. Canon, leader in photographic and imaging technology, is pleased to announce the launch of the EOS 300D 6.3 megapixel digital SLR. The lightest and most compact digital EOS camera ever is expected to ship with a recommended retail price of £899.99 including VAT for the body only, or £999.99 including VAT with the new EF-S 18-55mm f/3.5-5.6 lens. "Canon expects 400-500% growth in the digital SLR segment from 2002 to 2003 in terms of shipping volume*," Hiroshi Komatsuzaki, Head of Canon Consumer Imaging Europe. "The EOS 300D will play a key strategic role in this growth. By dropping the price so significantly, Canon is very deliberately putting high performance EOS digital technology into the hands of the consumer at a time of accelerating demand for high performance digital cameras". The EOS 300D bundles proven high performance technologies, such as seven-point, high-speed predictive autofocus, 2.5 frame per second burst rate, 35-zone metering and the DIGIC (DIGital Imaging Core) image processor, into a camera that is affordable to a much wider range of consumers thanks to its significantly reduced price point. Canon believes the EOS 300D to be the single most important consumer SLR camera since the AE1 in 1976. Just as the AE1 triggered an SLR revolution through being the world's first camera with an embedded microcomputer, Canon believes the EOS 300D will be seen as the point in history when the SLR market shifted irrevocably to digital. At the front end of the EOS 300D is the lens system and digital sensor. Film EOS users considering the move to digital will be pleased to learn the EOS 300D works seamlessly with any of Canon's renowned EF lenses. There are currently more than 60 lenses in the EF range. An APS-C sized sensor gives the camera a 1.6x magnification over 35mm film format. A new EF-S 18-55mm f/3.5-5.6 lens** has been specially developed in order to provide EOS 300D customers with the equivalent 28-90mm zoom range so popular with 35mm film EOS users. This lens takes advantage of the compact sensor size, employing a 'short back focus system' which mounts the lens closer to the sensor than in previous models. The result is high-quality images in a remarkably low weight, short-length lens. The 6.3 megpaixel CMOS sensor on the EOS 300D is almost identical to that found in the award-winning EOS 10D which remains the benchmark for digital SLR image quality. ISO speeds of 100, 200, 400, 800 and 1600 are selectable, giving recent converts from film cameras a familiar speed range. The EOS 300D is the first digital EOS camera to support the vendor-independent PictBridge print standard from launch date. Lab-quality prints can now be produced without the need for a computer by directly connecting the EOS 300D to compatible photo printers via a standard USB cable. The camera's large 1.8" LCD is used to review photographs to be printed and set print variables. Underpinning the camera's technical superiority is Canon's high-speed DIGIC processor. In the days of film, image processing was the role of film companies and mini-labs. With digital, the camera handles this critical task. Complex algorithms required to accurately process functions such as white balance and colour rendition are integrated into the DIGIC processor, resulting in high quality images with no trade-off in camera responsiveness. "A great digital image requires both quality raw ingredients and quality processing," says Komatsuzaki. "Superior lens and sensor technologies ensure the best raw ingredients. It is how DIGIC uses these technologies that gives the EOS 300D the edge". Seven selectable focusing points provide an ultra wide AF area generally only found in advanced SLRs. Focusing modes include One Shot AF (for fast, accurate single-shot focusing), and AI AF which can automatically switch to AI Servo AF for continuous tracking of subject movement - well suited to sports photography. A Manual Focus override is selectable from the lens. The EOS 300D boasts 35-zone 'Through the Lens' metering, essentially covering the full frame. Three metering modes (evaluative, partial and centre weighted average) assure balanced exposures in every situation. Along with the full range of automated and manual shooting modes expected in a high-end SLR, the EOS 300D features Programmed Image Control modes such as Night Portrait, Sports, Close-up, Landscape, Portrait and Flash off. A built-in automatic flash pops up nearly 90mm above the optical axis to lessen the chance of red-eye for better flash photos. The EOS 300D is superbly specified to deliver outstanding results in virtually any shooting situation. The camera has a shutter speed range of 1/4000-30 seconds, bulb and high-speed x-sync at 1/200s. Simultaneous recording to both RAW and JPEG (middle/fine) formats is possible, while 2GB and higher CompactFlash cards, Type I and II, are supported. Optional wired or infra-red wireless remote control is available. Adobe RGB has been added to the standard sRGB colour space. There are seven Auto White Balance settings (such as cloudy, tungsten, fluorescent, etc.) plus custom White Balance and +/- 3 stop White Balance Bracketing (WB-BKT). The EOS 300D comes complete with battery pack, charger, USB cable, video cable, and a wide embroidered anti-slip neck strap. An optional battery grip, BG-E1, will also be available. Purchase of the EOS 300D entitles customers to membership of the CANON iMAGE GATEWAY*** web portal for a 100MB online photo album for image uploads. A full software suite is included for handling image file transfers between camera and computer, managing and printing files, and preview and conversion of RAW image files. PhotoStitch is included for seamless merging of panorama shots. 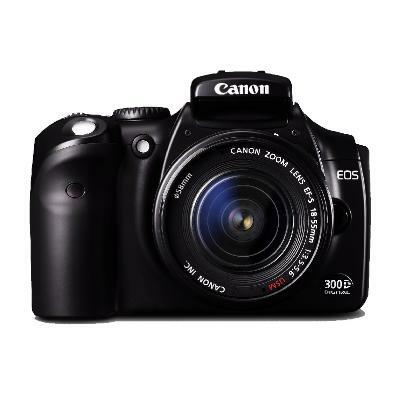 Canon says that the EOS 300D is the most important consumer SLR camera since the AE-1 in 1976. Just as the AE-1 triggered an SLR revolution by being the world's first camera with an embedded microcomputer, Canon believes the EOS 300D will be seen as the point in history when the SLR market shifted irrevocably to digital. "Canon expects 400-500% growth in the digital SLR segment from 2002 to 2003 in terms of shipping volume," says Hiroshi Komatsuzaki, Head of Canon Consumer Imaging Europe. "The EOS 300D will play a key strategic role in this growth. By dropping the price so significantly, Canon is very deliberately putting high performance EOS digital technology into the hands of the consumer at a time of accelerating demand for high performance digital cameras". The EOS 300D bundles proven high performance technologies, such as seven-point, high-speed predictive auto focus, 2.5 frame per second burst rate, 35-zone metering and DIGIC image processor) into a camera that is affordable to a much wider range of consumers thanks to its significantly reduced price point. An APS-C sized sensor gives the camera a 1.6x magnification over 35mm film format. A new EF-S 18-55mm f3.5-5.6 lens has been specially developed to provide EOS 300D users with the equivalent 28-90mm zoom range popular with 35mm film users. This lens takes advantage of the compact sensor size, employing a 'short back focus system' which mounts the lens closer to the sensor than previous models. This provides high-quality images in a remarkably low-weight, short-length lens. The 6.3 Megapixel CMOS sensor is almost identical to that found in the award-winning EOS 10D which remains the benchmark for image quality. ISO speeds of 100, 200, 400, 800 and 1600 are selectable, giving recent converts from film cameras a familiar speed range. The EOS 300D is the first digital EOS camera to support the vendor-independant PictBridge print standard from launch date. Lab-quality prints can now be produced without the need for a computer by directly connecting the EOS 300D to compatible photo printers via standard USB cable. A large 1.8" LCD is used to select and review photographs to be printed and set print variables. Underpinning the camera's technical superiority is Canon's high-speed DIGIC (Digital Image Core) processor. In the days of film, image processing was the role of film companies and mini-labs. With digital, the critical role of image processing must be handled by the camera. Complex algorithms required to accurately process functions such as white balance and color rendition are integrated into the DIGIC processor, resulting in highquality images with no trade-off in camera responsiveness. "A great digital image requires both quality raw ingredients and quality processing" says Komatsuzaki. "Superior lens and sensor technologies ensure the best raw ingredients. It is what DIGIC does with these that gives the EOS 300D the edge". 7 selectable focusing points give an ultra wide AF area generally only found in advanced SLRs. Focusing modes include One-Shot AF (for fast, accurate single-shot focusing), and AI AF which can automatically switch to AI servo AF for continuous tracking of subject movement ? well suited to sports photography. A Manual Focus override is selectable from the lens. The EOS 300D boasts 35 zone TTL metering, essentially covering the full frame. Three metering modes (evaluative, partial, and centre weighted average) assure balanced exposures in every situation. Along with the full range of automated and manual shooting modes expected in a high-end SLR, the EOS 300D features Programmed Image Control modes such as Night Portrait, Sports, Close-up, Landscape, Portrait and Flash OFF. A built-in automatic flash pops up nearly 90mm above the optical axis to lessen the chance of red-eye for better flash photos. The EOS 300D is superbly specified to deliver outstanding results in virtually any shooting situation. The camera has a shutter speed range of 1/4000 to 30 seconds, bulb and high speed x-sync at 1/200 second. Simultaneous recording to both RAW and JPEG (middle/fine) formats is possible, while 2GB and higher CompactFlash cards, Types I and II, are supported. Optional wired or infra-red wireless remote control is available. Adobe RGB has been added to the standard sRGB colour space. There are seven Auto White Balance settings (such as cloudy, tungsten, fluorescent, etc.) plus custom White Balance and +/- 3 stop White Balance Bracketing (WB-BKT). 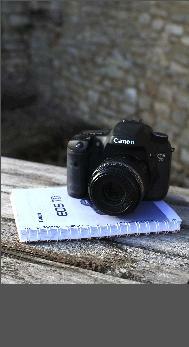 The EOS 300D comes complete with battery pack, charger, USB cable, video cable, wide embroidered anti-slip neck strap. Purchase of the EOS 300D entitles customers in many regions to membership of the CANON iMAGE GATEWAY web portal for a 100 MB online photo album for image uploads. A full software suite is included for handling image file transfers between camera and computer, managing and printing files, and preview and conversion of RAW image files. PhotoStitch is included for seamless merging of panorama shots. Many similar features to the EOS 10D, but with less user selection. Introduced a new lens mount - EF-S - which accepts all EF lenses, but also an EF-S 18-55 lens (this lens does not fit other EOS cameras).